Becky doesn't want to move away from her friends to return to Oakbridge, the tiny village her mother grew up in. She feels even worse about the move when she discovers a strange photo of her mum holding a baby - 12 years before Becky was born - and her mum slides into a deep depression before Becky can find out more about the photo. But when she meets Rosa May, a girl of her own age, things start to look up. Except Rosa has a terrible temper and a jealous streak - could she have a secret of her own? I enjoyed this one and thought that, as always with Conway’s books, the characters were really well-drawn. Becky is a lovely main character while Rosa May is really intriguing, and Becky’s mother’s depression is handled sympathetically. 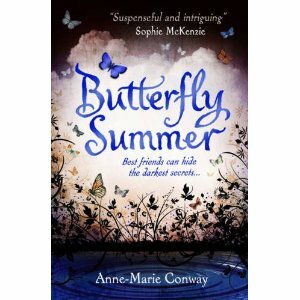 Like Conway’s Star Makers Club series, it’s really easy to read – she has a wonderful writing style which makes the book hard to put down and her prose captures the settings, especially the Butterfly Garden itself, vividly. It feels much more grown-up than the Star Makers Club, with a decidedly dark streak to it, and it's great to see an author change style quite significantly and pull it off so well. It's also decidedly tense! My only slight issue with the book was that I found it was rather predictable – however, that was perhaps partly because the back of the ARC gave significantly more details than the Amazon product description (and presumably the back of the finished book) does. If I hadn’t known these extra details, it may well have been that I found the ending more surprising. Having said that, despite being reasonably sure I knew how things would work out, this didn't spoil my enjoyment as I still enjoyed seeing how Conway brought everything together in the end. Definite recommendation to people looking for a thrilling read. There's no such thing as ghosts or is there as we turn the pages of Butterfly Summer and try and figure out the intensity and mystery of the story. A fun read, that you won't what to put down as you discover the truths behind the lies.